Doing complex tasks like ‘starting a business’ or ‘learning to drive’ means users have to find lots of different pieces of content and interact with government lots of times. The content and the transactions might be owned by different, siloed parts of government. And users are often left to figure out how to complete them in the right order and at the right time. 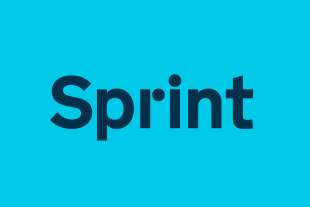 Because much of this content and many of these transactions are hosted on GOV.UK, we’ve been working to take all these bits and pieces and build them into a coherent service journey. This will be displayed on a single page, that will show the user all the steps in the process, what they need to do, and in what order. 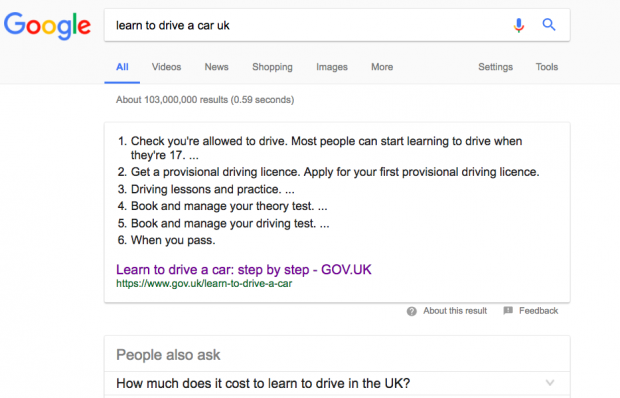 We’ve just launched our first service page – for learning to drive. Now we’re planning to use this approach with other services on GOV.UK. Here’s how we’re embedding end-to-end service design in GOV.UK – the home of digital government. There is a huge amount of content published on GOV.UK. There are currently about 400,000 different bits of guidance, transactions, forms, publications and other pieces of content on the site. We’ve already done a lot of work to make it easier for users to find content on GOV.UK. This included creating a new taxonomy, improving the navigation and working on search. This work is aimed at making it easier for users to find the thing they are looking for and to navigate around the site. Elsewhere in GDS, work had been done to develop the ‘task list’ pattern, which is a list of tasks that users will have to do in order to get the thing they need. This helped to prove the value of the ‘service journey’ approach. 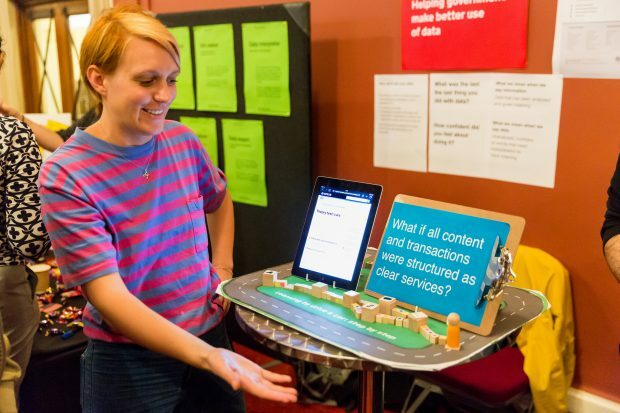 The next step from this is to help users navigate based on the thing they are trying to do, and to put the steps involved in doing a task in order, to build a service journey on GOV.UK. To pilot this work, we looked at some services that we knew a lot about and that we knew were relatively straightforward. We also wanted to be able to build on existing research. For these reasons, we settled on ‘learning to drive’. We wanted to develop a basic service page pattern for this service that we could then apply to other services. Building on this, we’ve created a step-by-step journey for learning to drive a car. From the first step – checking that you’re allowed to drive a car, to the final step – what to do when you pass. We’ve built a page that lays out the whole process step by step. The page shows users all the things they need to do – and in what order – to achieve the thing they want to do. 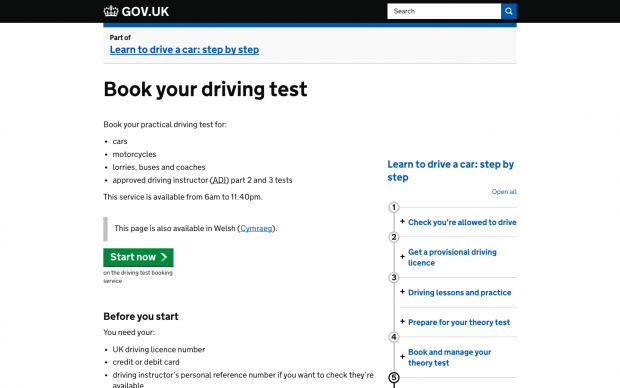 It has links to content and transactions across GOV.UK, such as the page for applying for a provisional driving licence. It also links to things outside GOV.UK, such as the Official DVSA Theory Test Kit app. Within 2 days of us launching it, the service page was already being displayed as a Google search snippet. The service page shows the full user journey in one place, but we also wanted to make it easier for users to understand where they are in the journey even when they’re not on the service page. To do this, we’ve put a link back to the service page, and included the service journey map on the right-hand side of all content pages. 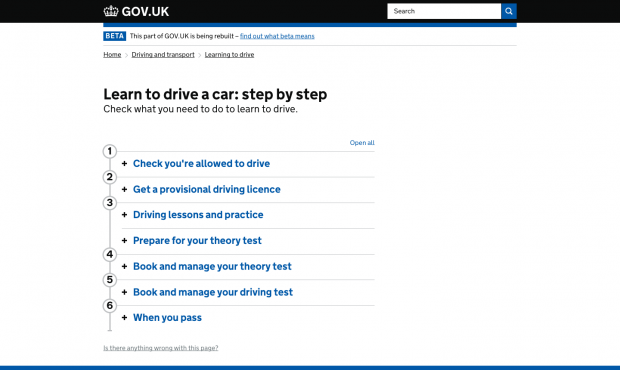 So, for example, if you visit the ‘book your driving test’ page, you can immediately see where you are in the service – on the fifth stage of a six-stage process. We hope that this work will make it easier for users to do the things they need to do. And to understand what is involved in a service, and the steps that things need to be done in. We hope this work will make things simpler and clearer for people in government too. In the Government Transformation Strategy, we committed to “developing end-to-end services that meet the needs of their users across all channels”. The work we’re doing on GOV.UK is helping to show what those end-to-end user-focused services look like, and what and who is involved in delivering them. It’s helping teams understand where their work sits in the context of the whole service and it’s helping government as a whole understand what those services look like. We’ve piloted this approach with the ‘learning to drive’ page and our next steps will be to look at the analytics and feedback on how this page and the service journey are working with users. If the feedback shows that this is the right approach, then we want to roll it out to other services, including more complex ones. We also want to look at things like what happens when a piece of content sits in multiple journeys and how we can accommodate more complicated service journeys, where there might be several ways for a user to achieve a task. We also want to look at how these journeys are published and who should own them. Ultimately, we want this work to be a tool that will help users and government understand, visualise and navigate full service journeys. We want it to be work that will help embed end-to-end services on GOV.UK and across government.